For something special, try these steak skewers seasoned with Chinese spices. Cut steaks into thin strips. In a bowl combine the soy sauce, Chinese five spice, garlic, honey and seasoning. Add the beef, cover and refrigerate for at least 15 minutes. Remove 18 large outer leaves from the cabbage. In a pan of boiling water, blanch these leaves for 1-2 minutes, then drain and plunge into a bowl of cold water. Thread a strip of beef onto a long metal or wooden skewer. Fold a blanched cabbage leaf into three and tuck a water chestnut in the cavity. 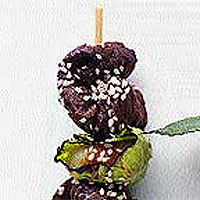 Push the skewer through the cabbage and water chestnut parcel. Alternate with more beef and cabbage parcels. Repeat to make 6 skewers. Cook over a prepared barbecue or under a preheated grill for 10 minutes, turning once and basting with any remaining marinade. Scatter with sesame seeds and serve with rice noodles.